Totaly new apartment for daily rent in Kharkov. Modern, two-rooms studio apartment for short and long rental in Kharkov. It is situated in the central part of a Kharkov, next to the underground Nauchnaya. The beautiful and modern furniture is in apartment. Italian cuisine with the built in technics. All kitchen equipment. There is supermarkets, banks, restaurants, parking, Night club Misto and bowling, restaurants Argentina and La Strada, next to this apartment. Very closed to main Svobodi Square and Gorky park. Apartment is located next to the center of the city, next to metro Nauchnaya. This apartment has 2 rooms, kitchen and bathroom. It has pleasant interior. Secure entrance door, gas water heating system, CD player, phone. The kitchen area includes a fridge, microwave, stove, and other basic kitchen necessities. New two-rooms apartment for daily rent in the centre of Kharkov. Apartment has modern design Safary Style for modern people! Nice design and colours will make your saty in Kharkov memorable. It has safe entrance (doors with domophon), a quiet place. Apartment has a double bed with an orthopedic mattress and sofa in modern style, an iron, an ironing table, the conditioner, plasma TV, satellite TV with 100 chanels, Unlimited Internet Wi-Fi, Jacussi. The kitchen is completely equipped for dayli rental in Kharkov, It has a bar table, all necessary home appliances, complete set of ware for meal and cooking, It is always tea, coffee, sugar. Near to apartment there are Gorkiy park, delfinarium, night club Misto, shops, cafe and restaurants There is a parking for cars. Nice, modern, two-rooms studio apartment for short and long rental. It is situated in the central part of a Kharkov, next to the underground of 23-August. Only 3 minutes walk from Metro station. Beautiful view on Lenin's prospectus opens from loggia. The beautiful and modern furniture is in apartment. Italian cuisine with the built in technics. All kitchen equipment. There is supermarket Billa, the banks, restaurants, market, parking, Night club and bowling, Ukrainian restaurant "Large village" next to this apartment. 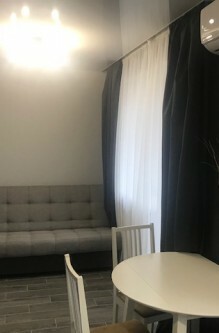 Elite one-room apartment class "Lux" with author's design in the central area of Kharkov, 2 minutes of walking from the underground item - "23 of August". The apartment is located on Lenin's prospect - one of the advanced and beautiful prospectuses of our city. Nayki prospect begins at Freedom area (second-large in Europe) and connects it to the Alekseevka district. On this avenue there is a lot of banks, hotels, shops, cafe and restaurants. Near of the house there are two sights of a city: the Botanical garden and the Shatilovsky source. This apartment has executed author's design. The apartment has doors on a coded lock. There is a parking for cars near. In apartment there is a double bed with an orthopedic mattress, the TV, a case-compartment with mirrors, an iron. All furniture is new. The built in kitchen furniture, a bar rack with chairs, a refrigerator, a microwave, the TV, an electric kettle, the conditioner.